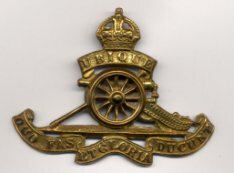 An RFA cap badge from WW1. Three of the Kirton in WW1 uniform while at home with their father. Left - Tom Kirton, KOYLI; centre standing - Isaac Kirton, Leicestershires (later Labour Corps); right - Robert Johnson Kirton, RFA; seated - their father, John Kirton. Jonathan d'Hoogue added that, "The chap on the right is wearing the 'Gor Blimey' soft cap with ear flaps that was issued for the first time in the winter of 1914/15. It was not meant to be worn when not on active service! I cannot make out his badge with 100% certainty but facially, he is almost certainly a brother to the other two and has his hand on his father's shoulder. Therefore, as he is dressed as a (horse) driver, I would say he is a driver in the artillery and therefore, he is Robert - the Bottesford web site has him as a driver in the RFA arriving in France in May 1915 - hence the cap!" Robert Johnson Kirton was born in 1890 at Easthorpe (Grantham Registration area), the third son of John W Kirton, a railway carpenter born in 1856 at Easthorpe, and Ann Kirton (nee Johnson), born in 1862 in the village of Gelston, Lincolnshire. A headstone in Bottesford churchyard commemorates his parents: Ann Kirton, died in 1939 aged 77, and John Kirton, died in 1945 aged 90. Theirs was a large family, with six boys and four girls, all born at the family’s long-standing home in Castle View Road, Easthorpe (then known as Belvoir Road): Ellenor (born in 1883), John William (b.1885), Isaac George (b.1886), Lucy A. (b.1888), Robert Johnson (b.1891), Sarah (b.1893), Frank (b.1894), Tom (b.1896), Edward Henry (b.1902) and Catherine (b.1904). By 1911, John and Ann had moved the short distance to a house on Easthorpe Lane, where they had with them Edward and Catherine, together with a grandson Richard Frost Kirton. John William, their eldest son, was now a railway platelayer and a married man. He and his wife, Alice (nee Eyre), had moved to Bunkers Hill Cottages, Easthorpe, and started a family. Frank was working as a farm labourer in Normanton on the farm of Josiah Wright. Tom was a farm boy on the farm of William Lovett, also in Normanton. Robert Johnson Kirton had found work further afield, as a waggoner on the farm of Thomas Sharp at Buckminster Lodge, Buckminster. In July, 1913, Robert Johnson Kirton married Mary Ann Alice Read, born in 1894, the wedding recorded at Newark Registration Office. Their first child, Frank, born later that year, was to serve in the army in the Second World War, and died in Burmah in 1944. Few details of his WW1 service have been found, but it is clear from his medals that he joined up in 1914. 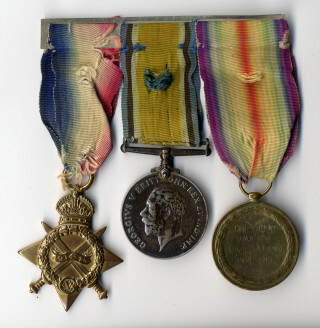 He entered France on the 22nd May, 1915, and remained in the army until 1920. He served in the Royal Field Artillery as a Driver, Service Number 72736. There is a bried note published on the 3rd May, 1916, in the Nottingham Evening Post, which said: “Mr Robert Kirton, while carrying dispatches on his motor cycle for the Allies on the western front, received no fewer than 28 bullets from a German machine gun in his body, and is still alive to tell the tale.” This report may refer to the Robert Kirton from Easthorpe, but this has not been confirmed. After being discharged from the army, Robert Johnson Kirton returned to civilian life. Electoral Rolls tell us that in Spring 1923 he lived in the village of Brandon, Lincolnshire, and that he remained there until the summer of 1926. From the spring of 1926, his name is accompanied on the electoral rolls by that of his wife, who gave her full name Mary Ann Alice Kirton. Later in 1926, they moved to Moor Farm Cottage in the nearby village of Stubton, then by1929 they were in the hamlet of Alverton, Nottinghamshire. By the time of the 1939 Register was drawn up they had moved again, and lived at 2 & 3 New Road, Orston, Nottinghamshire. In this record Robert described himself as a NCC (Notts County Council) Roadman. 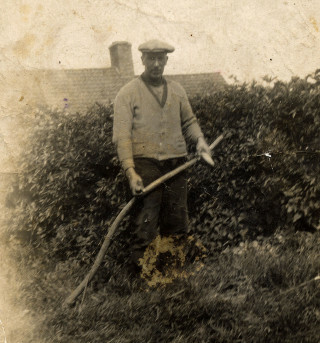 In addition to his wife Mary, their daughter Kathleen A Bampton (nee Kirton, born 15/10/1914), and sons Robert J Kirton (born 6/12/1919) a farm labourer (cowman), and Frederick Kirton (born 24/3/1923) also a farm labourer (poultry), were registered at the Orston address. Mary Ann Kirton died in June, 1946, aged 52, in the Bingham area (Orston). Robert Johnson Kirton outlived his wife by 25 years, and died in December 1969, aged 79, also in the Bingham area. Jonathan d’Hoogue is thanked for identifying the regimental cap badges and confirming the identities of the men in the photographs. What a great read. Thank you so much for this information on my Great Grandfather and also the articles on his brothers. They have helped me a lot with my research. I can’t even begin to think how Ann must of felt having four of her sons in the Army at the same time! !